According to the Daily Dose, small businesses in states hit hardest by the collapse of the housing market are having a hard time getting access to capital to grow and hire. In early April, Pepperdine University, in partnership with Dun & Bradstreet Credibility Corp., surveyed almost 6,000 small businesses about their success in accessing capital. The expectation for home prices and the percentage of those who think the U.S. economy is on the right path reached record highs in Fannie Mae’s April 2012 National Housing Survey. I’m sorry to say that the Fannie Mae poll may only reflect a mere flicker of hope. After the poll was completed, troubling unemployment numbers were released, and since a stronger housing market depends on an improving labor market the latter information undermined the former. The recent unemployment numbers do “not provide comfort that the current environment supporting the housing market is brightening. Whether recent improvement in sentiment will translate into a stronger market for home sales depends on near-term developments in the labor market.” says Doug Duncan, Chief Economist at Fannie Mae. I tend to agree, and while I hope that the poll is more than an aberration, I’m doubtful. 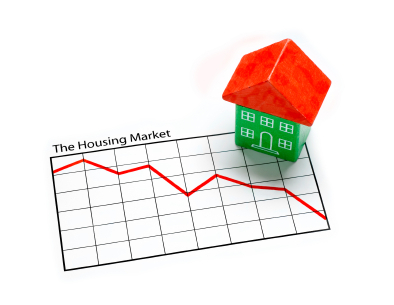 What do you think about the housing market? – As of 2005, there were 48.4 million mortgaged homes in the United States. – The price of homes has fallen more than 40 percent since a 2006 peak. – More than 14 percent of households face foreclosure or default. – The authors believe that the excessive amount of government control of the residential finance system is working against the housing recovery and that the United States must get its private investors re-involved in financing housing. The authors note that the United States may have to change some of the spending programs and tax expenditures of housing finance. The authors are fans of the Danish model. In Denmark, when a lender issues a mortgage, it must sell an equivalent bond with a matching cash flow and maturity. The bonds and the mortgages it mirrors stay on the banks balance sheets. When interest rates rise and housing prices fall, a homeowner can hedge the household finances by buying the corresponding bond. * Milken Institute is a non profit think tank and publisher of the book in collaboration with FT Press.